Reclaimed records play music in a whole new way: as a gramophone-inspired, wireless speaker. Jeff Davis' Bluetooth® speaker puts a new spin on old LPs, letting reclaimed vinyl play music in an innovative way: as the speaker itself. 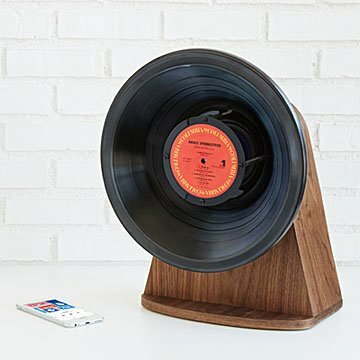 You can't drop the needle on these records, but they'll play your entire digital music collection in analog-inspired style—a cool way to give your smartphone an audiophile upgrade. There's also a nod to the nostalgic sweep of horn loudspeakers and gramophones, making it a true celebration of recorded music's long history, from steel needle Victrolas to the frontiers of streaming audio. Connect any device via Bluetooth® or the back panel auxiliary jack and enjoy the coolest music of all—yours. This design was a collaboration between Jeff Davis and our Product Development team. "They pushed me to celebrate the feeling of the record, and to create an item that has a sculptural presence as an object," Jeff reflected. With our extensive playlist of design experience and material sourcing skills, we also helped work out the Bluetooth® and driver components, settling on a top-of-the-line coaxial speaker that resonates best with Jeff's design. Request a Genre: Pick from a list of genres and Jeff will select an album from that category to incorporate into your speaker. Click here for details. Create a Custom Label—Add Your Own Text: Customize a speaker with your own personalized record label. Pick from one of four different designs and add your own custom text. Click here for details. Create Your Own Album Artwork: Order a speaker with a record label featuring a special photo or artwork that you submit yourself. Click here for details. Submit a Favorite Album: Customize a speaker with an album of your choice. Send in a favorite album from your collection and Jeff will use it to create your speaker. Click here for details. Request an Album: Customize a speaker with an album you request. Specify a favorite album or artist—we'll source it and Jeff will use it to create a speaker. Click here for details. Learn more about how the speaker is made here. Click for the Request a Genre printable card. Click for the Create Your Own Label printable card. Click for the Create Your Own Album Artwork printable card. Click for the Send in Your Own Album printable card. Click for the Request an Album printable card. Purchased as a gift for my 15 year old nephew. His comment upon opening the packaging was, "Whoa...this is so cool!" There was no question that he knew exactly what it was and he immediately plugged it in to start playing his favorite tunes. The sound quality truly impressed everyone in the room. The speaker now sits on the nightstand in his bedroom and he uses it daily. If you like to give gifts that are truly memorable and appreciated by the recipient....this is the one! Kudos to Jeff Davis! This is an amazing product! It just arrived at my house and the only downfall is that I have to wait until April when my parents are back from Florida to give it to my dad. However, I couldn't resist unpacking it and "testing" it out and it works perfectly and looks very very cool. The sound is great, it's so simple to use and instantly paired with my phone. It looks just like the picture, although I'm not in love with the particular record label that was used. But I chose not to customize it, so that's all on me haha! And it doesn't take away from the uniqueness and awesomeness of the product. I will check back in a few months with an updated review after I give it to my dad to let you know how he likes it :) Thank you for your hard work! I love this one of a kind speaker. I have a very large music collection I transferred to my computer and iPod and didn't have a way to listen to it without headphones. Now I can listen to my music anytime. It is so unique, beautifully designed and has great workmanship. This is a piece of art and will be a real conversation piece with a practical use. I LOVE IT!